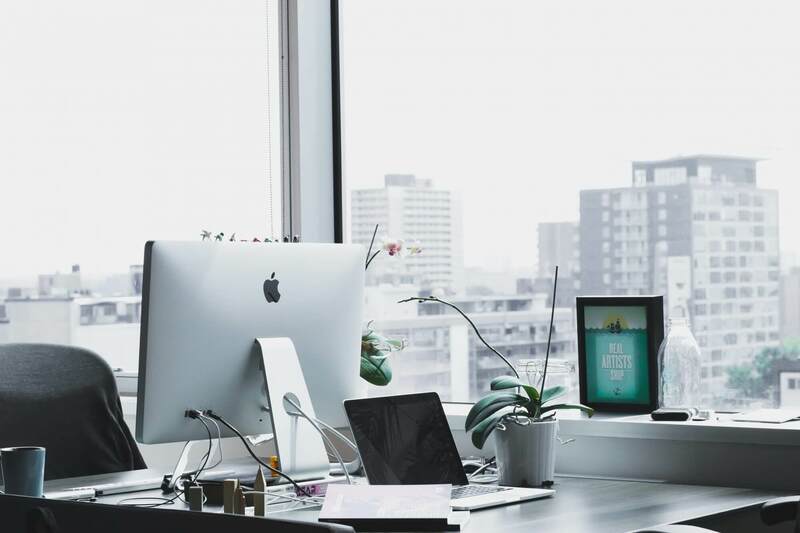 Although we live in a world of texting, tweets, Instagram, and Facebook, email remains the main mode of communication in the workplace. And while it is an incredibly convenient tool… email can also be an unbelievable waste of time. According to The Radicati Group, by the end of this year, the total number of business and consumer emails sent and received will reach 269 billion. 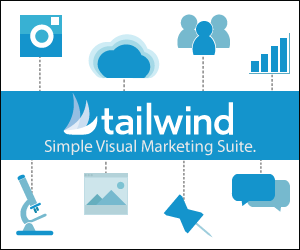 What’s more, the average office worker receives 121 emails per day – 121 emails! That. is. insane. With inboxes filling up faster than ever, we need to develop strategies for more efficient communication. 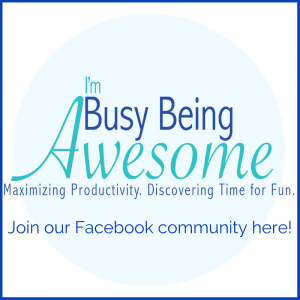 In doing so, we get our work done quicker, in turn allowing us to do more things we enjoy. (Always the end goal!) Are you interested? 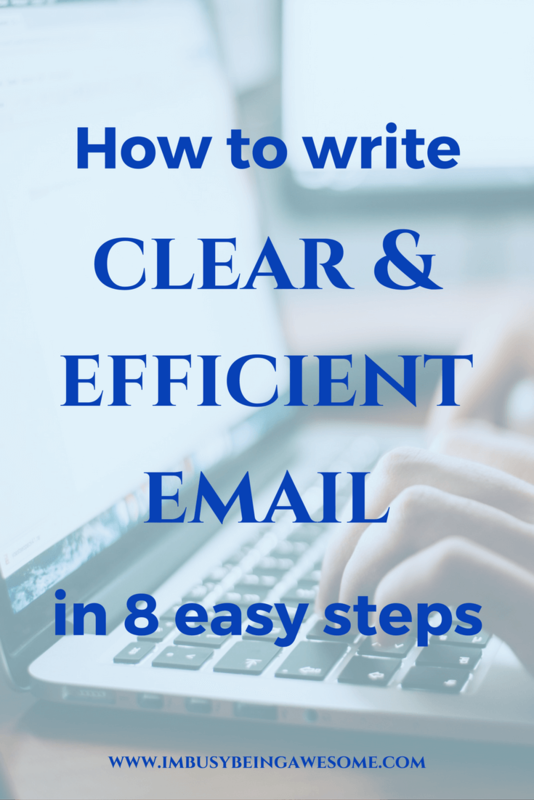 Then read on to learn how to write clear and efficient emails in 8 easy steps. Now before you even begin writing, however, first decide whether an email is the best mode of communication. 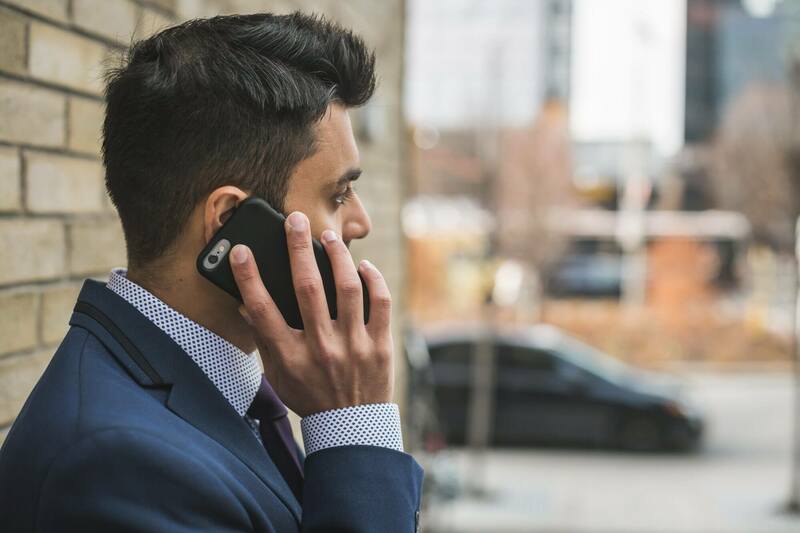 If you’re working with time-sensitive information, you’re trying to convey a long and complicated message, or the “tone” of your email could be misunderstood, you are probably better off picking up the phone. Look, I know no one likes physically talking on the phone anymore, but trust me, sometimes verbal communication is simply the better choice. On the other hand, if your writing with an easy request, a quick update, or a brief clarification, email can serve you well. Leaving vague subjects or – even worse! – blank subject lines are completely unhelpful to your reader. If your recipient doesn’t have any idea about your email’s content, and it’s floating somewhere amidst pages of other emails with specific titles, don’t expect to be on the high priority list. Similarly, vague messages like “quick question” or “hello!” may be a slight improvement from the dreaded blank subject, but not by much. 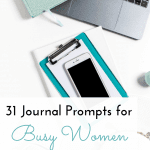 Instead, give your reader an idea of what your message is about: “Last week’s social media data”, “Minutes from Friday’s meeting”, “Confirming details for Thursday’s lunch”. It’s a simple step, but it makes a big difference. If you are writing to a friend or a close colleague, addressing them by their first name is completely reasonable. If you are writing to your professor, however, you probably don’t want to open with, “Hey Paula!” Even worse – in my humble opinion, – is simply, “hi!” Seriously – that drives me crazy. I have a name…please use it. Long story short, before you shoot off a quick email, pause and consider your recipient. If in doubt, lean toward formality and reassess the situation after receiving their response. I hope this note finds you well/ I hope you had a nice weekend/ I hope your summer is off to a great start etc. I don’t walk up to someone, say hello, and immediately make a request, and I don’t think it’s good email etiquette either. That being said, there is some debate on this. Some people argue that including such greetings is a waste of time and ultimately unnecessary, so I’ll leave that one for you to decide. Perhaps consider your own preference and go with that. This is probably one of the most important tips on the list. 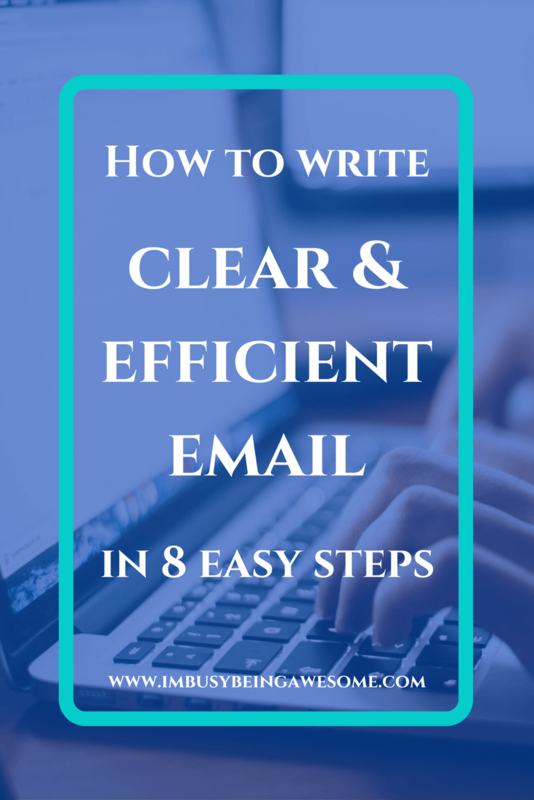 It is very easy to get long-winded and wordy in your emails. Avoid this as much as possible. Remember, email is supposed to be a quick means of communication. (Just think of those poor office workers who receive 121 emails a day!) If your message is turning into several paragraphs, chances are you’re better off making a phone call. When you begin writing the body of your message, start by briefly stating the main reason for your email. Follow up with key points of information that provide your reader with context, and conclude by stating specifically what you need. 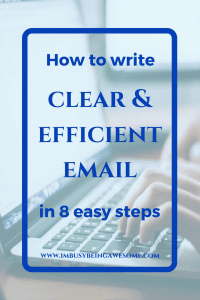 By keeping it short and sweet, you convey the information clearly, you save the reader time, and you don’t waste your own time writing an unnecessarily long email. It’s a win-win. I get it – there are certainly times when you can’t convey your information in 4-5 sentences. Perhaps you are providing a weekly update to your staff. Maybe you have a lot to say, but you avoid the phone because you want time to consider each word carefully. Whatever the reason, if you find yourself writing a lengthy email, try using bullet points and headings. These techniques help break up dense paragraphs of text, which makes the information easier to read and absorb. I don’t think we need clarification here. Just because email is quick and easy doesn’t mean you need to forget your manners. After you’ve finished the main body of your email, and you’ve clearly conveyed what you need, conclude your email with a simple “Thank you,” “Best,” “See you tomorrow,” “I look forward to hearing from you” etc. Then, of course, follow with your name. If this is a work-related email, you need to include a signature, especially when you’re reaching out to someone new. Be sure to include your full contact information (name, title, business, phone, email), following each email. There is an option in your email where you can pre-set your standard signature. This means that each time you write an email, your signature is automatically included. If you set that up, it’s one last step you need to remember. It’s amazing how many emails are filled with typos, spelling errors, a lack of capitalization, and missing punctuation. Check and double check to make sure your’s aren’t; this is especially important in a business setting. Additionally, read for clarity and tone of message. One of the biggest fallbacks of email is that you completely lose your tone of voice. (This can really result in disaster if you try and write with sarcasm to someone who doesn’t know you very well.) Strive to maintain a professional, positive tone, with direct language, and you’ll be set. So that’s it! 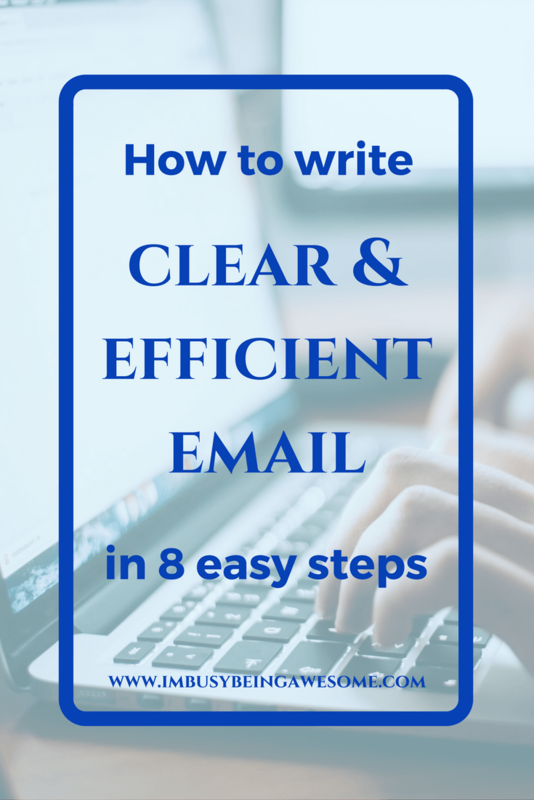 That’s how to write clear, efficient emails in 8 easy steps. Do you have any tips for proper email etiquette? Do you get near that 121 emails a day mark? What is your most common mode of communication? Let me know below! Great tips. Especially since I respond to a lot of emails in my full time job as well as in blogging . Thanks for this one! Great tips! Totally agree on the read and re-read! Such an important step that we often forget! 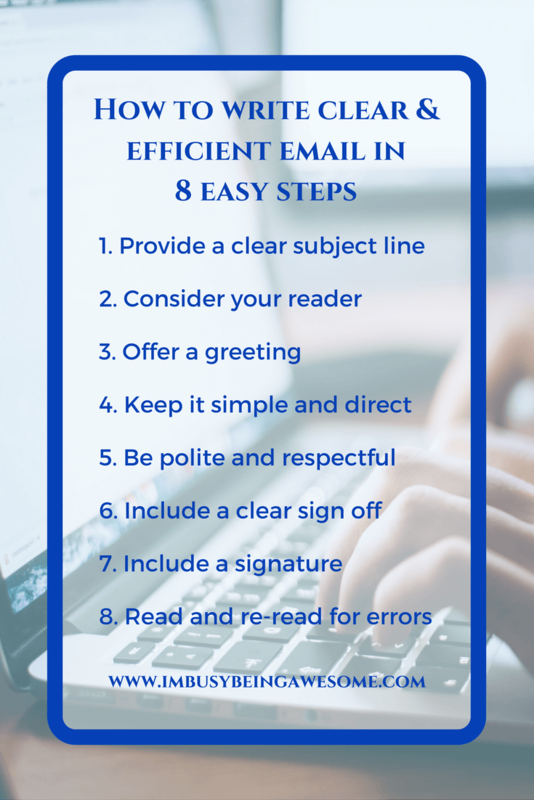 Isn’t it amazing how many emails circulate around and how very few have all of these steps included? I’m always grateful when the emails I receive have a clear message communicated in a short amount of space. I don’t know how many times I’ve seen an email cause more confusion than help. Great way to put it out there! Thanks, Lori! I completely agree – confusing emails require clarification, which usually results in additional confusing emails. It’s a vicious cycle that we need to break! Haha. Next in your series needs to be “How to respond to an email and actually answer the questions the person has asked you and don’t leave them hanging or needing to send you another email to ask the same things again and again and again” LOL!!! Thanks so much for this guide! YES!!! It drives me crazy when I clearly convey my one important question in my email, and the person responds without even acknowledging/attempting to answer it. OR I respond to someone else’s answer via email, and they send me another asking the same thing. Ridiculous – ha! 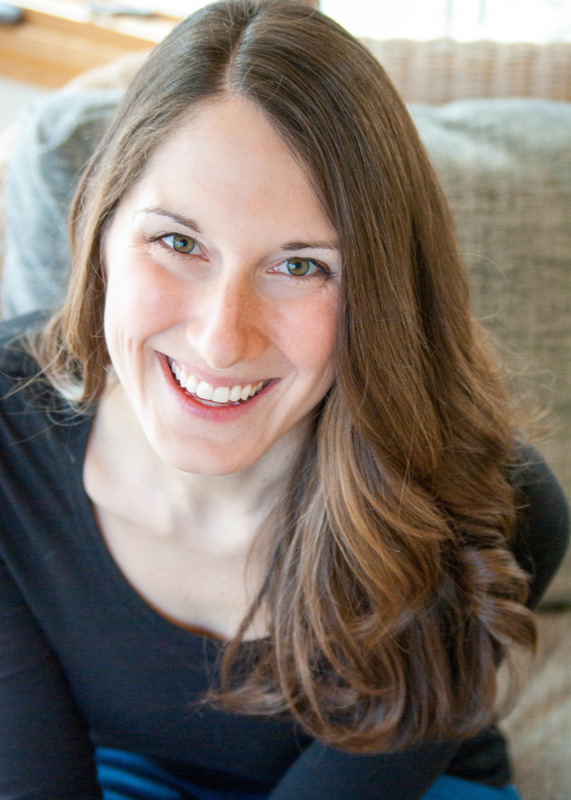 These are all great tips for writing emails! I always like to end with “look forward to hearing from you” or similar, because it makes me a bit more hopeful they may reply 😂 I’m definitely improving on my email etiquette, but these are great reminders! Constantly need to work on the 4 to 5 sentences part, but we’re getting there! And headers and formatting definitely help break it up if there is a lot of information. Agreed – Sometimes 4-5 sentences is simply not realistic, so using headings/bullet points helps make the longer sections much easier to read. Great tips! I always read my emails multiple times, and I like to leave it for awhile and come back to it later to read once more before I send. I find that letting things sit for a bit allows me a fresh look when I come back. That’s a great idea, Katie. It’s always easier to spot typos or awkward/unclear sentences when you come at it fresh. Poorly written emails are one of my biggest pet peeves. Thank you! Great ideas! 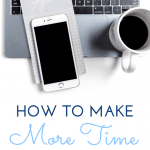 I need to work on getting my inbox under control just like most of the office workers out there but I will definitely put these tips to work starting now. Thank you for these tips! I am really forgetful in general, so I actually like long emails instead of conversations because I can go back to the email for whatever information I need. But I totally see your point. Sometimes the phone is best. That certainly makes sense – long emails are great for reference 🙂 In that situation, I think it’s nice if the email is organized with bullet points/headings to break up the information. These are great tips! Especially rereading and proofreading! These tips have forced me to remember several conversations that I have heard my professors have with my classmates, other professors, and me. I try to be conscious of how my emails and formatted and worded depending on the situations. 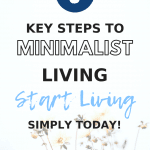 These are some great and practical tips. I could definitely work on #8. I make one too many spelling mistakes. It’s so easy to do! If it’s an especially important email, I will read it out loud and/or have someone else read it to double check for errors/clarity. Thanks for the tips! I need to work on my subject lines!